Density bonus tools allow for the developer to add to height and density on a parcel in exchange for providing public benefits, such as watershed protection, open space, or other amenities and services. Density bonuses create incentives for developers to provide public amenities in exchange for a higher density level than allowed under existing zoning. The “amenity” in many cases is including some low income housing as part of the development. However, there are other public amenities that can be provided by increasing density, such as protecting water resources as demonstrated in the case study example, providing public access to open space, protecting environmental resources like rivers, and even protecting views. Increasing density also offers an opportunity for the developer to realize more profit on the same amount of land. Density bonuses must be designed carefully to address community concerns about changes to neighborhood character and to ensure that the amenity that is provided sufficiently justifies the increase in density. In addition, the planning agency may need to provide information to the development community to make the case for higher density. Developers may be inclined to build what they have always built, and they don’t necessarily recognize changing preferences in the housing market toward more walkable communities with access to services. Providing concrete examples of water-smart, higher density development can help persuade developers to consider new approaches. The option encourages variation in buildable area and minimum building setbacks, and maximum lot coverage is negotiable. It sets maximum density limits based on the minimum lot size of the underlying zoning district and the slope of the land. 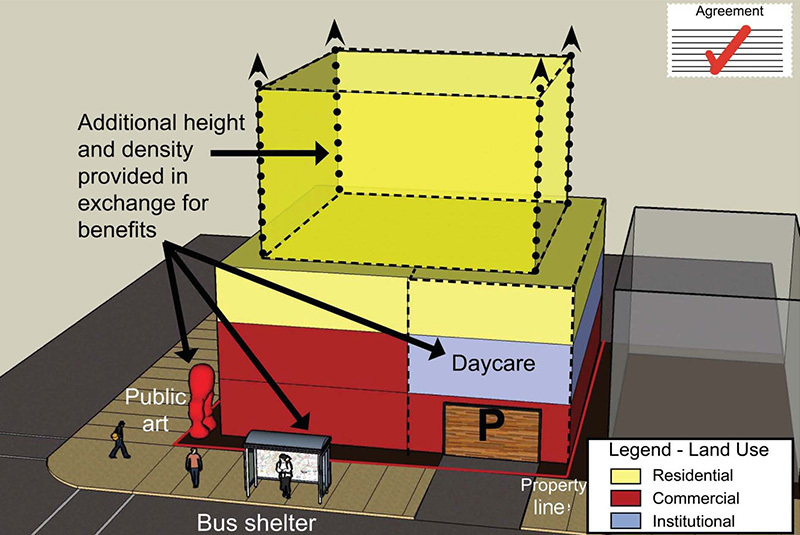 The maximum density may be increased by a factor of 1.5 if the developer incorporates 9 of 12 conservation and sustainable design elements in the ordinance. Density may be further increased by a factor of 2 if the developer incorporates additional elements. Elements include using only drought tolerant landscaping, prohibiting turf in common areas, and using lot-scale rainwater harvesting and graywater systems. At the higher tier, a number of low impact development options include use of pervious pavement and impermeable surfaces designed to direct storm run-off to infiltration features, and retention of water on-site. The County had not received applications for this option as of the end of 2016, which is thought to be due to development slow-down. The Conservation Subdivision Handbook contains examples of density bonuses for open space preservation. Philadelphia Green Roof Density Bonus can be found here.